After three months we have new version. Changelog is quite long. Ubuntu users can update from my ppa repository where are packages for Lucid, Maverick, Natty and Oneiric. Ubuntu 11.10 users, please use this version. It fixes problems with new Ubuntu scrollbars and other annoying bugs. A few days after 1.2.0 we have new bugfix version. It fixes qrz.com XML search. Files for download are at http://www.cqrlog.com/node/4, Ubuntu users can update from cqrlog repository. This version fixes a lot of bugs and has only one new function - HamQTH.com XML search. The latest major addition to the country files is The Republic of South Sudan with the validity since July 14, 2011. It is the #341 on the current DXCC list with ADIF nr. 521. The position is focused to Juba, the capital. As of 21 July, the International Telecommunication Union (ITU) still has not announced a prefix block for the Republic of South Sudan. With high probability, the expedition team will use the license issued in March with the callsign of ST0R (Sierra Tango Zero Romeo) unless the ITU issues a new prefix. Due to this fact, the country files must be considered as provisional, however the ST0 prefix is counted as new country since July 13. The former ST0 prefix used for guest operations between 1995/01/01-2011/07/13 is terminated to July 13, 2011. If ITU issues a new prefix block to the Republic of South Sudan, only prefix will be changed and ST0R will be moved to the CallResolution.tbl. ST0 will be assigned again to the gest operations from Sudan. NOTE that the former South Sudan (ST0) valid before 1995/01/01 remains as deleted country with the ADIF nr. 244. The current South Sudan is a brand new DXCC country for all! Download the latest country files here. 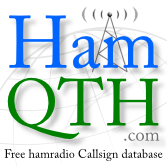 I've created new free hamradio callbook - http://www.hamqth.com. Since the owner of one popular server decided to hide all addresses until you are not registered, I decide to write my own. You can also register to our server, edit or add your own address, write some biography details, put photos here etc. What is unique, you can choose if your address or other contact details will be shown also to unregistered users. It is your choice, not my. I won't hide your address or any details. Only you can do that. A few days after release 1.0.0 I have to release 1.0.2 where is fixed bug with loading MySQL libraries on Fedora 15 and Debian unstable. I also added one new function. A few days after release 1.0.0 I have to release 1.0.1 where is fixed bug with loading MySQL libraries on Fedora 15 and Debian unstable. I also added one new function. After three months of releasing alpha, beta and RC versions, there is 1.0.0 final. It took almost 4 years to reach this milestone. When we started in 2007, it was not expected that CQRLOG will have over 700 users worldwide (and some left Windows and moved to Linux to use our CQRLOG). Actually, there is > 700 registered users of the CQRLOG web site but the real number of users is probably much higher.